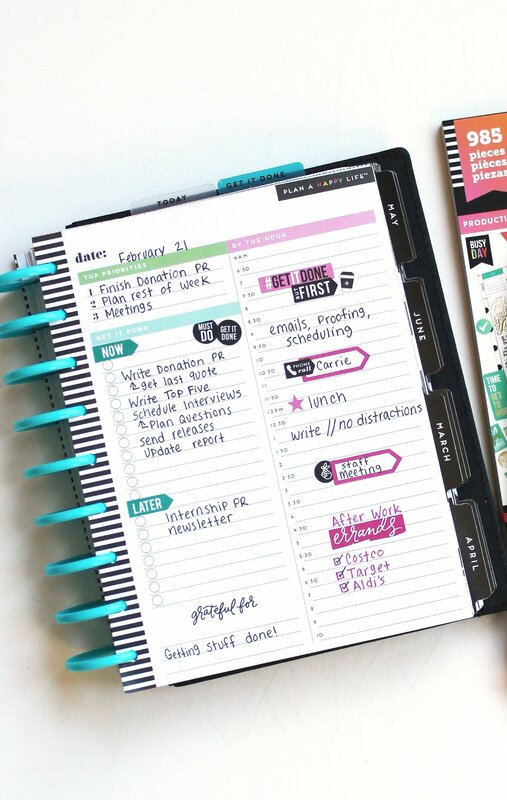 Design Team member Jen Randall (IG | blog) is MINI Happy Planner® obsessed! (Aren't we all?!) Not only does she love all the pint-sized planners, but the accessories are adorable too! 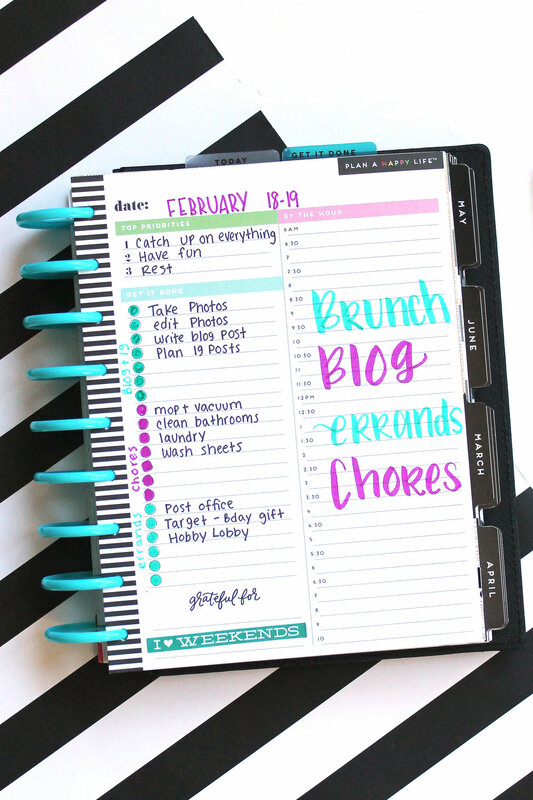 One of her absolute favorite items are the MINI Happy Planner® Page Protectors. Pocket scrapbooking is a favorite of Jen's, and these are so fun & easy to put together. They also make great dashboards! "When I am putting together my weekly spread in any of my planners - BIG, CLASSIC, or MINI - using these small page protectors are a great way to add interest. I love mixing different sizes and adding visual interest to my weeks in my memory keeping and functional planner. There are so many different ways to create them. 5) Attach clear adhesive tabs to the side of the page protector (You can find these at office supply stores like Staples. While you are there, check out the new Happy Planners® on display!!!)" Shop supplies Jen used by clicking on the items below. The Happy Planner® makes planning for travel the easiest (and prettiest) it can be! We have flight information stickers, and plenty of other products and embellishments that allow you to organize your packing lists, hourly lists, ect. Today we're sharing how mambi Design Team member Erica Canant (IG | blog) planned for a work trip to Chicago in her CLASSIC & BIG Happy Planners®. "I received an incredible opportunity to do some work travel for the first time with Celebration Church, and I couldn't wait to plan and finally use the air travel stickers! The destination was Chicago for a two-day training, so I used both my personal CLASSIC 'This is You Year' and my work BIG 'Modern Marble' Happy Planners®. First, I busted out any and every sticker pack that had traveling stickers! For my work one, I used a lot of the detailed morning and afternoon hourly stickers from the 'Productivity' pack. These were perfect for filling in every training session that I would be attending each day. That's definitely my go-to sticker package for work. For my packing lists, the side 'notes' section was perfect for that! I needed to pack personal belongings as well as remember a few items for work, so I liked splitting the two. I also used the punch so that I could put in my flight itineraries and all of my training printouts! After planning everything in both planners, I felt so much more prepared for my first time to Chicago!" Shop some supplies Erica used by clicking on the items below. With the latest release by me & my BIG ideas, Design Team member Sheena MacComiskey (@planwithus_mommyandme) wanted to jump into the pretty MINI 'Market Floral' Happy Planner® right away! She has been using it as a mini memory/gratitude bullet journal, that sits on her side table and allows her to reflect at the end of the day. "To create this mini 'frankenplanner' style bullet journal insert, I took (2) graph papers by me and my BIG ideas®, taped them together using my favorite washing tape, and decorated it with the Alpha Value Sticker Pack and mambi stickers! I tried to think of things I wanted to track monthly, habits I want to focus on, and then created a monthly graph to mark off the times I completed them, daily. I also trimmed down a Progress page from the mini Fitness Happy Planner® and adhered it with some glue and fun washi, this serves as an end of the month reflection for my bullet journal!" "I didn't want the front side of the paper to be bare, I trimmed down a divider and trimmed down a currently dashboard from another mini Happy Planner® I was hoarding and created a cute currently page! I can't wait to see how this planner turns out at the end of the month and how it will evolve as the months go by. Stay tuned for an update in the near future!" Shop some supplies Sheena used by clicking on the items below. One of mambi Design Team member Marisa Yciano's (IG | blog) favorite things is her MINI Happy Planner® notebook. Marisa always seems to have a million things running through her mind each day (don't we all) so she decided to make a sectioned notebook to organize them, and today we're sharing how her pages are set up for April. "Lately, I have had ideas about a new room makeover, putting together a spring capsule wardrobe and new blog post ideas for the upcoming months. I tend to get very messy when writing things down, and when I look back at my notes I get overwhelmed. I decided to 'pretty up' the pages in my MINI Happy Planner® notebook to keep myself focused and clear." "I used some washi tape to add color to my pages and alphabet stickers from the Alphabet Value Pack Sticker Book to add titles to each page. I also love having the mini sticky notes so I can write down a quick thought if I need to. I love having a notebook in the mini size because it's so easy to take it with me!" "I'm not a teacher but that doesn't stop me from using the teacher value pack sticker book! I love that it's full of color and super functional. I decided to only use the teacher sticker book this week in my on the go MINI Happy Planner®. I love having my planners full of color and this sticker book has all the colors! I'm obsessed. This sticker book has plenty of functional stickers like checklists, icon stickers, and reminder boxes. Some of the stickers don't fit perfectly but it's not a big deal if things are a little off. The one thing I like most about this sticker book are the awesome motivational stickers! Sometimes during the week we need a little motivation to get things done." Shop some supplies Marisa used by clicking on the times below. 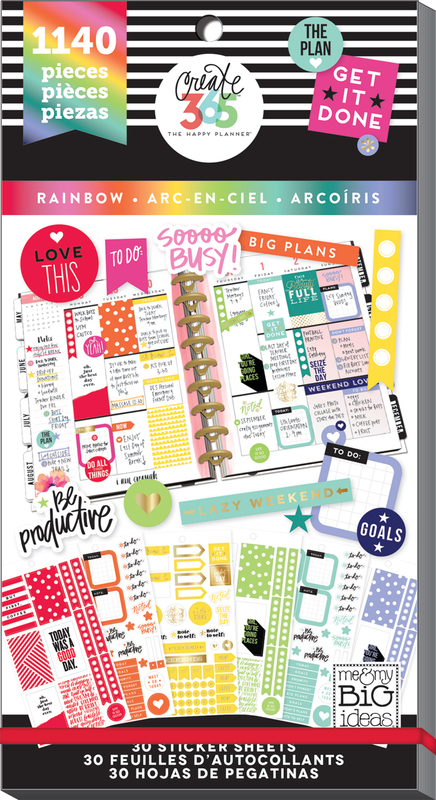 There's nothing like a new pack of stickers to get you motivated to fill your Happy Planner® pages! You can decide on the color scheme you want to use, and then choose stickers that apply. You could start with your favorite sticker, and build around that. There are so many ways to go about it, but today we're sharing the #before and #afterthepen of a special March week in the world of mambi Design Team member Heather Kell (IG | blog | YouTube) - and our newest stickers are everywhere! "The first full week of March is a special week in my household! It's our wedding anniversary and my husband's birthday. I knew I wanted the spread to be extra special and extra cute. It was the perfect reason to break out the new sticker packs from mambi! I mainly used the 'Make it Happen' sticker pack. I love the florals in this pack and thought it matched well in my spread. I love how this spread screams 'SPRING!' It makes me so happy for the upcoming season! These new sticker packs make it so easy to coordinate a spread really quickly. I'm in love with how it turned out and I am so excited to fill this spread in!" We have noticed more and more of you planner babes using our system to create 'social media planners'. Today we're sharing how mambi Design Team members Erica Canant (IG | blog) and Stephanie Howell (IG | blog) dedicated one of their MINI Happy Planners® to organizing their social media content and scheduling when to post. "I have been wanting to invest more time in my blog and Instagram - getting a more regular posting schedule down. In order to do that, I knew I needed to P-L-A-N or else it wouldn't happen.So, I dedicated one of my MINI Happy Planners® to the social cause! I chose to use the MINI because I simply wanted to schedule them out, note the topics, and know when I needed to take pictures etc." "For the month spread, I simply marked what days I wanted to post my blog, any important dates that I'd need to take pictures for or plan further out in advance, and any set Instragram posting days like #FunCornerFriday or #mambiQuoteOfTheWeek. Then for the week, I planned it out in more detail. After doing this for a couple of weeks now, I have noticed that each week I will probably want to lay it out a bit differently. That's one of the things I love about The Happy Planner® — I can keep it consistent each week and month, or I can change it up whenever I want!" "...and decorating is still a must, especially for this! There are so many mambi stickers that bring great inspiration and reminders when it comes to social media. For instance, I used the 'Compete with Yourself' sticker so that I would remember to not compete with others on these platforms. It's really easy to compare my IG game with others; but the only person I need to compete with...is myself! I love having that reminder at the top of my March month." "At the start of the year, I made it a goal to be a better blogger in 2017. I have blogged for about 10 years now, but it's fallen by the wayside last year and I want so badly to change that. ENTER: the MINI Happy Planner® that I converted to my functional blog planner!" "Easy peasy and super simple, just the way I like it. I added a blog post topic for each day and some layered tiny sticky notes with reminders. I also used the notepad to add a little brainstorming/topic insert in the middle of my weekly spread. I'm really trying to keep my planning life simple and functional this year. I have a tendency to worry so much about the decorating that I don't actually get stuff done." Shop some supplies Erica & Stephanie used by clicking on the times below. Earlier this week we shared how the 'Spring Bucket List' page in the 'Seasonal' sticker value pack was used on a MINI Happy Planner® page, but today we're sharing how mambi Design Team Marisa Yciano (IG | blog) used it to memory plan on a BIG Happy Planner® spread. "I wanted to do something a little different for memory keeping this season. I would typically use the Bucket List stickers from the 'Seasonal' sticker value pack on a monthly spread in my everyday planner but I thought they would work great in my BIG memory keeping planner." "I used a week from the undated BIG Happy Planner® Extension Pack because everything I documented on these pages actually happened over a of couple weekends. I dated each photo by writing it in and adding a watercolor heart to separate the month and day. I also used the watercolor flower stickers from the 'Today is Your Day' sticker value pack because they are too cute NOT to use for a spring layout! I also decided to add some of my current favorites like what I've been listening to, watching, crafting, and cooking - a cut up a currently list to do so. I am a big fan of writing down current favorites because they become so fun to look back on!" Shop some supplies Marisa used by clicking on the items below. The Happy Planner® Daily Pages are so helpful for busy days! Today we're sharing how mambi Design Team member Katie Barton (IG | blog) found two ways to use them to make sure she's getting the most out of the day in the hopes that it will inspire you to get even more functionality out of your Happy Planner®! "I had a few meetings this day, and I wanted to make sure I got the most out of the time I was at my desk. I started by filling in my meetings with label stickers from the rainbow value pack. Since these things needed to be done at specific times, I used the stickers to draw attention to them. From there, I could see the blocks of time I would be at my desk, and I noted what I wanted to be working on during those blocks of time. These notes helped me know what to get started on as soon as I sat down, so I didn't waste time wondering what project to focus on. I divided the to-do list section on this page into two sections: Now and Later. Most of the 'Now' projects were listed in the morning. I used the 'Later' section for listing projects that popped up during the day. Whenever someone emailed or called with a new project, I listed it here so I could worry about it later without interrupting my work flow." "On the second daily page, I tracked the projects I wanted to accomplish during a weekend. I didn't have any scheduled plans, so I used large marker letters to note what I wanted to be doing during general blocks of time. The focus of this page was the to-do list. I used markers to color in the checklist circles to divide my list into categories, and I labeled the categories to the side so I knew where on the list each task needed to be. I loved having my list divided like this, because it made it easy to see what I should work on next without searching through a long list."